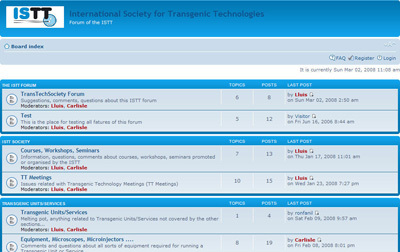 Currently, we have 58 videos on different aspects of animal transgenesis, kindly and generously shared by various ISTT Members. Videos are available within the members-only area of the ISTT web site. If you are not yet ISTT Member, please consider registering to our Society. 40) Visual phenotyping of spatial acuity in mice with the optomotor test. Cylinder turns left, albino mouse turns random because it cannot see, as described in Lavado et al. 2006.